When you have one of the smallest wilderness areas in the world, it only makes sense to have one of the longest names for a wilderness area to fill the space, both in words and in syllables. Fire Island is a very important barrier island that shields Long Island, New York, from much of the ravages of the Atlantic Ocean. It paid a bit of a price for its role as protectorate during Hurricane Sandy in 2012. Part of Fire Island that took a lot of the storm was the part that was along the southern and eastern shore of Fire Island, a small strip of land called the Otis G. Pike Fire Island High Dune Wilderness, designated by Congress as a federal wilderness area in 1980. Fire Island itself is a very narrow, 32-mile-long island just off the southern part of Long Island. The island itself is no more than a half-mile wide at one point, and as narrow as just 200 yards. About seven miles of this island on the eastern part is designated part of the Otis Pike Wilderness, from the visitor center to the west all the way to Watch Hill on the east. A couple of private beaches on the far eastern side of the island are not part of the wilderness and essentially make the easternmost boundary. The wilderness area was named after former New York congressman Otis G. Pike, who headed up the initiative to create the wilderness and have it protected by the National Park Service. At just more than 2 square miles (about 1,400 aces), it is one of the smallest wilderness areas the NPS operates and is the only wilderness area in all of New York state. The original wilderness was about 1,363 acres when created in 1980, and about 17 more acres were potentially available to be included at a later date should they meet federal wilderness standards. Most of that was noted as compliant by the Federal Register in 1999, then the last acre was added in 2015 after Hurricane Sandy wiped out remaining structures on the land, and it was incorporated into the Otis Pike wilderness area. 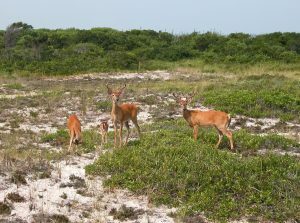 While not very large as a wilderness area, the Otis G. Pike Fire Island High Dune Wilderness is packed with nature and outdoor activities for most tastes. There is backcountry camping available, as well as hiking along the old Burma Road. The terrain is varied, with pine forest, a grassy wetland, sand dunes – all of which provide habitat for white-tailed deer, herons and various waterfowl that use the wilderness as a “rest stop” on its usual migratory path. If you are someone who likes to do some saltwater and/or ocean fishing, the Otis G. Pike Wilderness provides opportunities for anglers to angle for bluefish, striped bass or winter flounder among several other saltwater species that roam around Long Island. Though it is a tiny wilderness spot, the Otis G. Pike Fire Island High Dune Wilderness is a vibrant space to get a wilderness experience just 50 miles from Manhattan.